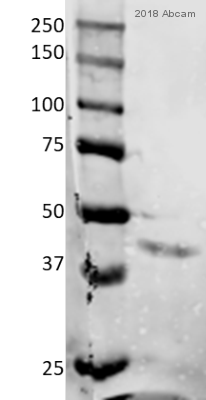 Rabbit polyclonal alpha smooth muscle Actin antibody. 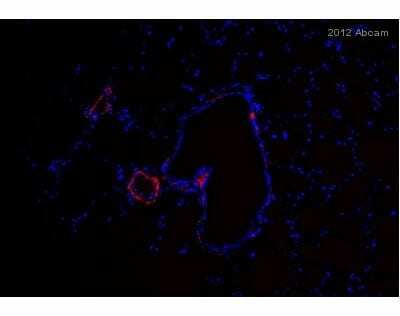 Validated in WB, ELISA, IHC, ICC, ICC/IF and tested in Mouse, Rat, Chicken, Guinea pig, Cow, Dog, Human, Pig. Cited in 1047 publication(s). Publishing research using ab5694? Please let us know so that we can cite the reference in this datasheet. 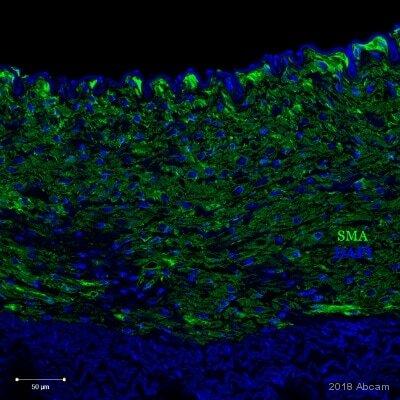 I'm ordering two antibodies (Anti-alpha smooth muscle Actin antibody and collagen III) for rabbit fibroblast. 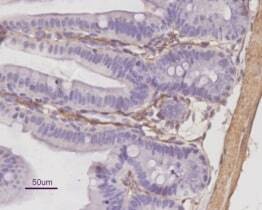 My tissue is rabbit conjunctiva, and I am planning to use the tissue samples for immunochemical staining. We place an implant under the conjunctiva and connect it to the rabbit anterior chamber. 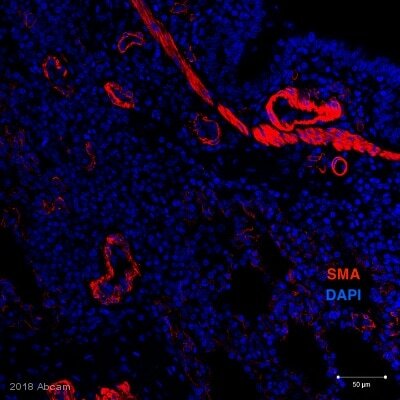 We are interested in examining the fibroblasts specifically, as well as any scar tissue that is present. When choosing between ab5694, 18147 and 115944, do you have any suggestions as to which would work the best for HRP detection? 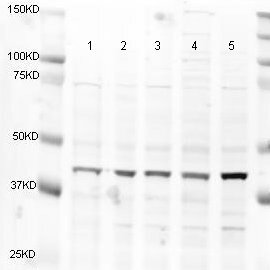 I have checked the website and the datasheets of these three antibodies and it seems that only ab18147 has been tested for cross-reactivity with rabbit. 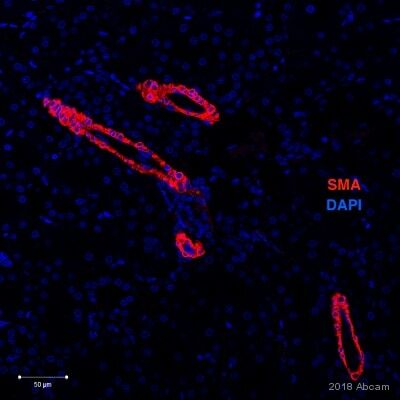 The other two antibodies are not known yet if they recognize rabbit alpha smooth muscle Actin. 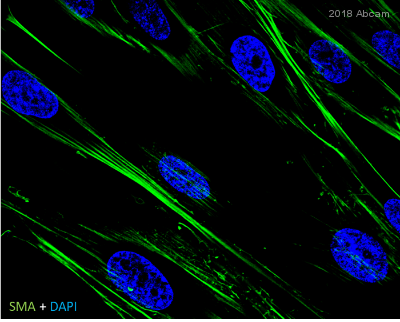 However, it is important to mention that according to the datasheet ab18147 recognizes the alpha-smooth muscle isoform of actin but it does not react with actin from fibroblasts (b-and g-cytoplasmic), striated muscle (a-sarcomeric), and myocardium (a-myocardial). Has the shelf life for AB5694 been changed? 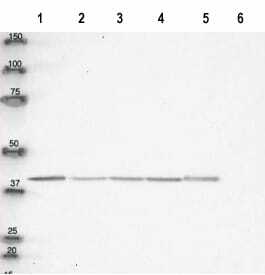 A customer has bought this antibody some years ago from you and then the shelf life was several years. Now she has bought the antibody again and the shelf life is much shorter now. Why the change? We do not have set expiration dates for our products. I am therefore also not aware that the information on the shelf life was changed. We indeed increased the length of our Abpromise guarantee to six month instead of 120 days. I can confirm that most antibodies are stable and can last for anywhere from a few months to several years if stored properly, so we strongly recommend that you follow the storage instructions on the datasheet for the antibody you purchased. These conditions will vary among our antibodies, therefore, it is important to verify the storage conditions for each of our products when you receive them. We guarantee all of our products to work for at least six months from the date of purchase when stored correctly. 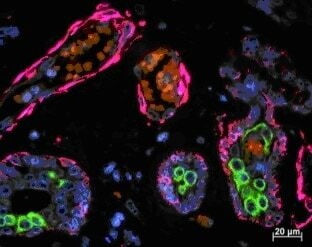 Non-specific staining of actin filaments in epithelial cells was observed. Do you have any suggestions? 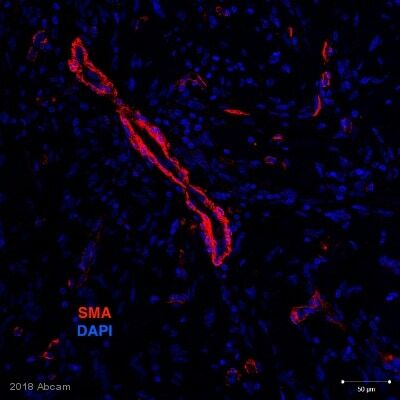 I have some information which may be of interest to you in regards to anti-alpha smooth muscle Actin antibody (ab5694). 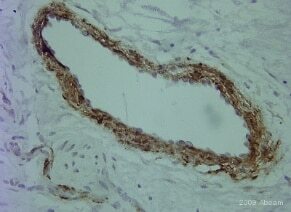 It may therefore be that the band you are seeing is stillspecificfor smooth muscle but expressed in the epithelial layer.